Whether you are using Waterfall, Agile, Lean or anything in between, team collaboration has to be a priority. To their detriment, project teams will frequently rely only on emails for all their collaboration. For effective communication, project teams need a portal for collaboration. SharePoint provides a common workspace for the project team to share documents, so that every member within the project team has all the necessary information about the project. SharePoint also provides default issues and risks list to log all factors that may affect the project, and thus enables team to take necessary action to prevent or reduce their impact. 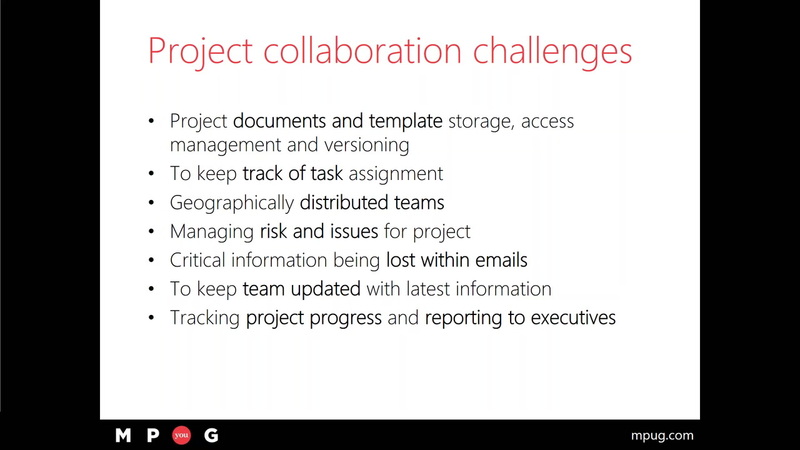 During this session we will explore the integration between Project and SharePoint team sites and how to modify the team site, making it the center of your team’s collaboration. Don’t simply hope or even demand collaboration, learn how to make collaboration easy and useful. Empower your team to collaborate with SharePoint team sites.